Louisiana-based Tetrafusion scored big with their self-released debut Absolute Zero, a satisfying work of instrumental progressive metal. Prog critics and fans were uniformly impressed by this young musical depth and maturity. The praise was well deserved. 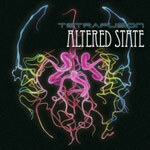 Now signed to Nightmare Records, Tetrafusion returns with Altered State, and things are about to get interesting. Without adding due intrigue, here's the only information you need: this time around Tetrafusion has added vocals to their performance. Some listeners might shudder at the thought of their favorite instrumentalist or instrumental band delving into vocals, and maybe Tetrafusion had more than a few reservations before leaping into this new venture. But fear not as keyboardist Gary Tubbs ain't half bad. (Guitarist Brooks Tarkington helps on background.) And actually, between the composition and performance, Tubbs/Tetrafusion sounds oddly, but not too closely, like Matthew Bellamy/Muse in moments. Generally, while Tubbs' vocals won't cause anyone to toss mantles of rose wreaths upon his shoulders, they are an interesting addition to their immense bag of musical tricks. Do they detract from the music, the core of Tetrafusion's reputation? I think the verdict might be out on that issue, at least for another album. Nevertheless, the real reason we dig Tetrafusion so much is their genuinely entertaining progressive music. So here's the second interesting thing: Altered State finds the band digressing from the path of progressive metal. The entire texture of this works feels much more like progressive rock with immense doses of rock fusion. (This makes Altered State an apt title for this disc.) Certainly there are heavier moments (note the patterns of Monologue, by example), but nothing quite reaching the edgier side of metal. For instance, about four or so minutes into Collage of the Present, Tarkington goes off on a solo that reminds of late 80's Pat Metheny, and then turns into some rollicking rock. This intriguing complexity infiltrates the entirety of Altered State allowing for a tremendous outlet for original ingenuity, and precious little room for colorless vapidity. (Although I might say that the aforementioned song, Monologue, is the weakest on the album.) Last Chance, Altered State, and the richly diverse Tears of the Past are everything that you would expect from Tetrafusion. Leaving the verdict on the inclusion of vocals aside, Altered State finds Tetrafusion in excellent form, offering another platter of progressive music that pushes their own boundaries. Quite recommended. Leaving the verdict on the inclusion of vocals aside, Altered State finds Tetrafusion in excellent form, offering another platter of progressive music that pushes their own boundaries.